In part two of our follow up to last year's article on which player's our Premiership clubs should buy we cover Tottenham, West Ham and Fulham. Click here to see yesterday's piece on Chelsea and Arsenal. What was the problem position? What did the club do about it? Like rivals Arsenal over their goalkeeping situation, not much. Indeed, Spurs eventually sacrificed England world cup winger Aaron Lennon to the ol' cutting-in-on-his-shooting-foot strategy with sporadic success, but that's not what Lennon's game is about. He burns left full backs with his pace and balance down the right to set up others. What is it about football managers that when they find a player's best position they proceed to use him almost exclusively in another, less effective role? Anyway, Spurs hung their noses over Atletico Madrid's Martin Petrov before he jumped to Sven's pacesetters at Manchester City and they're still casting about. What happened to the guy we suggested? I have been after him for a long time. He is two-footed, can shoot, can cross, can make goals and can score goals. Precisely, Aidy. But you tell Martin Jol that, and he just doesn't listen. Still, Palace are apparently due another quarter of a million smackers if McAnuff helps Watford to promotion, so we may yet see him on the big stage before long. Who are we suggesting this year? Look. Martin. We'll try this one more time. Three years ago we saw this relatively unknown Norwegian left winger give a torrid time to the Australia defence in a friendly at Craven Cottage. You could see exactly why a Premiership club had recently shelled out £1.5m for him, though he had been struggling at that level in the three months since the transfer. He's still at the same middle-ranking club and last season registered a handy six goals and an awesome twelve assists, bettered only by Cristiano Ronaldo and Cesc Fabregas. If Tottenham are really serious about this Champions League lark, isn't it about time they marched purposefully up to Ewood Park and refused to leave until they'd persuaded Blackburn to part with Morten Gamst Pedersen? By various interesting ways and means they acquired an old-fashioned inside forward who inspired them to last day survival with many a piercing run at the opposition defence. At times, though, he played more like an NFL "committee" running back, repetitively grinding out the yards, but in sore need of a big guy to convert the possession to scores inside 20 yards. Carlos Tevez flattered to deceive somewhat as he doubled his non-penalty goal tally with three in the final 180 minutes of the season while at least three other Hammers matched his trio of assists. Newcastle United struggled, too, but midfielder James Milner still grabbed three goals and six assists in 35 appearances. Having been on the brink of a permanent move to Aston Villa last summer he was surprisingly recalled by the Geordies, offered regular chances to play and has been handed a new four year contract by incoming manager Sam Allardyce at the start of this season. He was rumoured to be in Steve MacLaren's thinking for the recent Germany friendly, but notched up a record 29th appearance for the Under 21s instead. Given that none of their strikers has scored a league goal in three games and Kieron Dyer looks to have picked up a very nasty leg injury, not unlike Dean Ashton last year, we can't blame West Ham for showing an interest in Inter Milan's 25 year-old Brazilian Adriano (pictured), who's available on loan, though another player with a troubled past may not be ideal. Another lively forward who is currently out of favour with his club after persistent battles with injury is one Harry Kewell of Liverpool FC. A short term move to the East End to join recent team-mate Craig Bellamy might suit all parties. If, however, Hammers fans think they already have one Merseyside cast off too many they might go out on a limb and consider unsettled Serbian international striker Danijel Ljuboja. The twenty-eight year old has fallen out with both Stuttgart, his owning club, and Hamburg, the club he was loaned to last year, though he has shown enough in his career that Gordon Strachan was interested in him for Celtic a year ago and Real Betis, Marseille and Siena are said to have enquired after him in recent weeks. 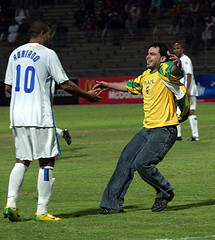 Picture of Adriano being welcomed during a January 2007 friendly by a Bahraini fan who unwittingly caused the match to be abandoned via Leo Heart's rather excellent Flickr stream. Claus Jensen returned, but couldn't take on the mantle of Steed Malbranque as he left for Tottenham, Fulham struggled and manager Chris Coleman paid the price. With former Chelsea man Alexei Smertin and Papa Bouba Diop in central midfield now they have plenty of power, but are still lacking in game winning subtlety. Dwight Yorke left Terry Butcher's Sydney FC for Sunderland and was a key member of their Championship winning campaign. He's featured in three of their four Premiership outings this season. One of the few areas that new boss Lawrie Sanchez has not reinforced is central defence and he's just agreed to sell Saturday's own goal scorer Zat Knight to Villa, which we happen to think is good business. Curtis Davies was one of a group of excellent youngsters in a buccaneering Luton promotion side that provided six of the members of the PFA's 2004/5 League One Select XI. He stepped up to Premiership West Brom and performed impressively again in a sadly relegated side before picking up England Under 21 honours, another PFA selection in their Championship XI for last season and one of those pesky metatarsal injuries that cut short his campaign. This summer he's had three transfer requests rejected and no club has so far matched the Baggies' valuation of him at somewhere not far south of £10m. With the Zat Knight money in his back pocket Sanchez might have just the reserves of cash necessary to bring the 22 year old from Leytonstone back to the capital.